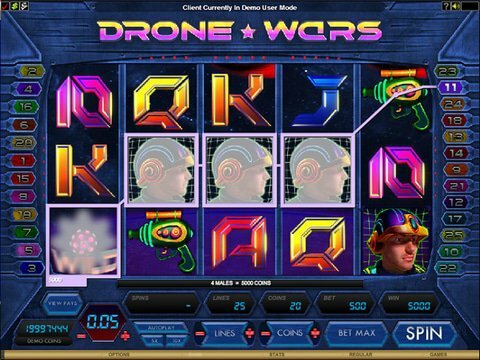 The sci-fi themed Drone Wars is a killer online slots game is visually stunning 3D that has 5 reels and 25 paylines. You can win 20,000 coins and $4,000 on a single spin. You can also enjoy it here in a free demo version without registering to our site. No matter what your online slots bankroll Drone Wars, which you can play at Microgaming online casinos, as the betting range is from 1 cent all the up to $100. There is not a multiplier, but there is a wild and scatter symbol, free spins, and a bonus game. A few of the symbols in Drone Wars are a futuristic warrior, a ray gun, a rocket, and the card symbols of 10 through A. The wild symbol is the pink and purple sphere symbol and it not only replaces other symbols, but automatically doubles your win. Spinning on at least 3 of the Cyclops-style drone symbols and triggers the bonus game, or games, as you have 2 options of the planetary assault or the space attack. In the games you are attacking aliens and in each of them you can win free spins with a multiplier of up to 50x your bet for that spin. The 3D graphics in Drone Wars are stellar and the symbols look like they are popping out of the screen. The sounds can be adjusted and they will put you in a space age mood. You can play Drone Wars for free in the demo mode and in the expert mode you can use the autospin feature. Even with such a flashy and colorful interface the game is easy to play and all of the betting control buttons are at the bottom of the screen. Canadian players can find the Jackpot City no deposit bonus here as well. The exclusive amount is a free $10. Then take advantage of their 100% up to $500 welcome bonus offer.